Salary negotiations are an accepted, and oftentimes expected part of the hiring process. A non-committal stance, coupled with any information gathered during the interview process will put you in the best position to negotiate salary/benefit terms. The moment of truth is finally here : A prospective employer presents you with a job offer. Accept the first offer made and you may very well be making the least of a perfect opportunity. 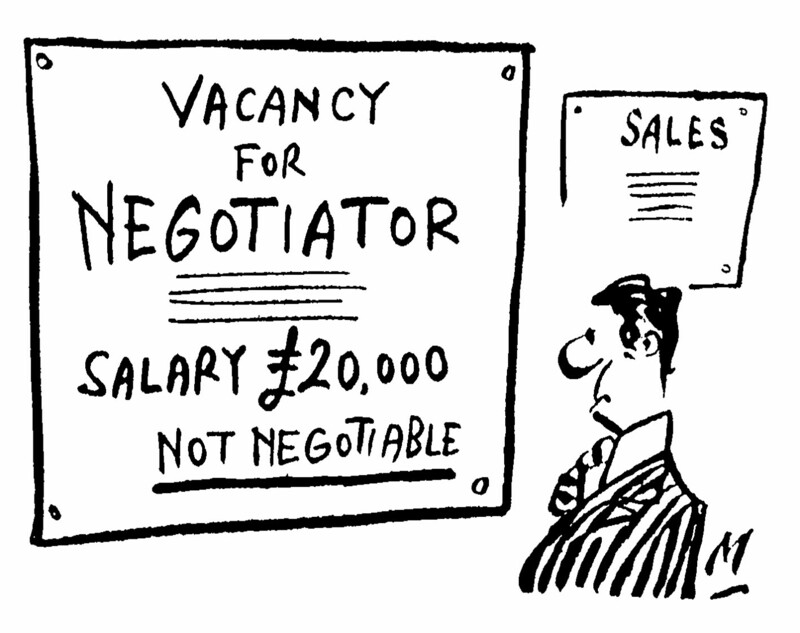 Salary negotiations are an accepted, and oftentimes expected part of the recruitment process. At this point, it’s most important to know your worth, value and leverage when negotiating for the best offer possible. 1) Negotiation is a two-way process; not a win/lose challenge. 2) Most employers will negotiate within the guidelines of fairness. 3) As always, knowledge is power. The longer you can keep your bottom-line acceptance offer a secret, the better. The fact that you’ve been offered the job means you are wanted. Salary negotiation is your time to investigate and find out just how wanted you are. Ask questions. Make certain you understand their responses as meant. By asking questions you can get a better idea on what they will, and will not do. Higher salary out of the question? Maybe insurance benefits, vacations days or a pension plan is where your leverage lies. Seeing the negotiation as two parties -you, and the hiring manager- trying to find the maximum benefit for both involved will help you to take a more diplomatic approach to the process. In order to make fairness work to your advantage, take some time to research salary ranges for the position you’re applying for, and do some research on your prospective employer as well. Some companies, like the larger, bureaucratic-types, or union-run workplaces, may be less flexible when it comes to negotiating for better terms. Start-up companies, and smaller companies are more likely to be open to salary negotiations. If you posses a unique skill set or expertise, that can make you a more proficient candidate for the position. Communicate these assets clearly, and use them as leverage. Granted, the hiring manager may very well be aware of your abilities, but he only needs to offer you what YOU think you’re worth. Some employers will ask your salary expectations long before any actual discussion, or negotiation on salary is underway. For this reason, it’s always best to approach the entire interview process with salary negotiations in mind. The longer you can hold off on committing to any terms, or an amount, the better. Be prepared to answer these questions throughout the interview process so you don’t get caught committing to what may have been a flexible term. Approaching the interview process in the same manner as the interviewer is approaching you can give you the information needed to negotiate the best possible offer available. Find out how the position you’re applying for became available. Knowing this information might give you an idea on how quickly the position needs to be filled. Ask about advancement opportunities and the skill sets needed to qualify for them. A non-committal stance coupled with any information gathered during the interview process will put you in the best position to negotiate salary/benefit terms. Getting a job that you really want should be seen as the means to an end rather than the desired end result. Once the salary negotiation process begins, you can actually end up with a much better position -one with perks- than originally anticipated.